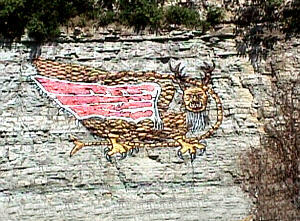 The Piasa Bird (pronounced Pie-a-saw), is a local legend in the Alton area. Its foundings go back to 1673 when Father Jacques Marquette, in recording his famous journey down the Mississippi River with Louis Joliet, described the "Piasa" as a birdlike monster painted high on the bluffs along the Mississippi River, where the city of Alton, Illinois now stands. According to the diary, the Piasa "was as large as a calf with horns like a deer, red eyes, a beard like a tiger's, a face like a man, the body covered with green, red and black scales and a tail so long it passed around the body, over the head and between the legs." The creature was given its name by the Illini Indians, "The Piasa", meaning a bird that devours men. Many moons ago, there existed a birdlike creature of such great size, he could easily carry off a full grown deer in his talons. His taste, however, was for human flesh. 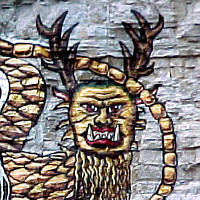 Hundreds of warriors attempted to destroy the Piasa, but failed. Whole villages were destroyed and fear spread throughout the Illini tribe. Ouatoga, a chief whose fame extended even beyond the Great Lakes, separated himself from his tribe, fasted in solitude for the space of a whole moon, and prayed to the Great Spirit to protect his people from the Piasa. On the last night of his fast, the Great Spirit appeared to Ouatoga in a dream and directed him to select 20 warriors, arm them each with a bow and poisoned arrow, and conceal them in a designated spot. Another warrior was to stand in an open view, as a victim for the Piasa. When the chief awoke in the morning, he told the tribe of his dream. The warriors were quickly selected and placed in ambush. Ouatoga offered himself as the victim. Placing himself in open view, he soon saw the Piasa perched on the bluff eyeing his prey. Ouatoga began to chant the death song of a warrior. The Piasa took to the air and swooped down upon the chief. The Piasa had just reached his victim when every bow was sprung and every arrow sent sailing into the body of the beast. The Piasa uttered a fearful scream that echoed down the river, and died. Ouatoga was safe, and the tribe saved. The re-creation of the original painting (one version is depicted in the image at the top of this page), has been a local landmark and, until just recently, could be seen on the bluff just north of Alton on the Great River Road. Due to weather damage and an increase in local traffic, the painting had been removed for restoration and relocation. UPDATE! -The Piasa Bird now rules over the River Bend once again. Through the efforts of local citizens , government and business advocates, the painting on the bluff has been restored.